Sold in the USA as a Clarkson/DeVlieg and in the UK as the Clarkson, March and (occasionally) Smart & Brown, this useful machine in its Mk. 1, Mk. 2 and Mk. 3 forms is the most commonly encountered one in its class. Solidly built, with heavy castings to absorb vibration and provide a rigid structure to support the grinding wheel, it has consistently proved to be an accurate and reliable workhorse in both production and toolroom situations and was used in the Clarkson factory for the finish grinding of their well-known and respected milling cutters. Although the machines could be supplied as units for bench mounting the 364 lb (165 kg) Mk. 1 was normally fitted to a narrow cast-iron plinth and the 504 lb (228 kg) Mk. 2 mounted on a much wider and more stable cast-iron stand. The Mk. 3 was almost completely redesigned and offered only on the maker's fabricated sheet-steel stand with built-in electrical controls and a decent storage cupboard to store the essential accessories. As each improved version of the machine was announced the previous continued in production - even the Mk. 1 remaining available after the machines were badged as being manufactured by "March Engineering". The price of the unit varied considerable with the Mk. 3, at £11,000 in the early years of the 21st century, costing approximately three times as much as a Mk. 1. The Mk. 1 and Mk 2 machines were very similar and used a thick rectangular cast-iron plate onto which was bolted, at the rear, a motor unit and grinding spindle. At the front, sitting on a swivelling housing, was a T-slotted compound table driven by a screw through 53/8" (136 mm) when being moved towards and away from the wheel - and by a rack-and-pinion lever-feed for 61/2" (165 mm) of travel across the wheel's face. The Mk. 2 version was the first to have a graduated dial on the table's screw feed and was offered with an extended table that almost doubled the length of the machine's cutter-holding capacity. Unlike the relatively primitive Mk. 1 the ends of both the standard and extended tables on the Mk. 2 carried dust shields - with the feed screw protected by concertina guards at front and rear. In addition to the swivelling housing (which allowed the whole table unit to be rotated), the table itself was split horizontally and the top arranged so that it could be turned relative to its base. On late models the option was offered of a "roller table" fitted with bolt-on housings containing precision linear bearings with cross rollers running in hardened and ground V ways. This assembly was also offered for retrofitting to earlier machines and gave such a smooth and easy travel that the makers had to fit a simple friction screw to give some artificial feel to the action. Whilst a rear-mounted 1/2 h.p 2800 rpm motor giving a maximum wheel speed of 4000 r.p.m. was fitted to the Mk. 1 on the Mk. 2 a more powerful 2-speed 3/4 h.p. unit was used with speeds of 4000 and 6000 rpm. On both models the drive from the motor was taken to the grinding head by (depending upon its age), a flat or V belt. On the earliest models both the belt and grinding wheel were guarded by hopelessly-inadequate and cheaply-constructed strips of sheet-metal but on later versions much safer more enveloping covers were provided - the belt guard being either a properly-made sheet-steel housing or even (as found on a few examples), cast iron or aluminium. The grinding wheel and motor unit could be raised and lowered by slackening two large hexagon nuts on the left-hand side of the head and turning a vertical jacking screw with a T-handle. On early versions the table screw feed lacked a graduated collar but later models were improved by the fitting a proper ball handle assembly and a micrometer dial. On both the Mk. 1 and Mk. 2 the height of the spindle line above the table was 8" (203 mm) and the minimum 21/4" (57 mm). Some means of work support is naturally essential with any type of cutter grinder and, while the options' list included some very expensive and specialised devices, all models were supplied as standard with a selection of simple attachments as well as a light unit. However, even the standard accessories allowed the operator to perform a usefully wide variety of tasks on common types of milling cutter. If the standard parts are missing from a used machine all is not lost: reference to the drawings and pictures on other pages will show that most are easily within the compass of any reasonably-equipped equipped machine shop. The Clarkson's combination of heavy build, rise and fall to the wheel, a rotating table base, the split-rotating table, a compound table feed and simple accessories will allow almost any small cutter for horizontal or vertical milling use up to 6-inches (152 mm) in diameter to be re-sharpened quickly and accurately even by a semi-skilled operator. Prices on the used market vary widely with a basic Mk. 1 in working order commanding a few hundred pounds whilst a thoroughly well equipped Mk. 3 might fetch several thousand. An early Mk. 1 Clarkson Tool & Cutter Grinder with both grinding wheel and flat-belt shielded by hopelessly inadequate strips of sheet-metal. An un-graduated T-shaped handle was used to elevate the spindle. A Mk. 1 Clarkson tool & cutter grinder branded as a "Smart & Brown"
Mk. 3 centre-support brackets were designed to be reversed on the table to accommodate the longest-possible workpieces. Guards removed for clarity. Almost completely redesigned the much more robust and larger-capacity Mk. 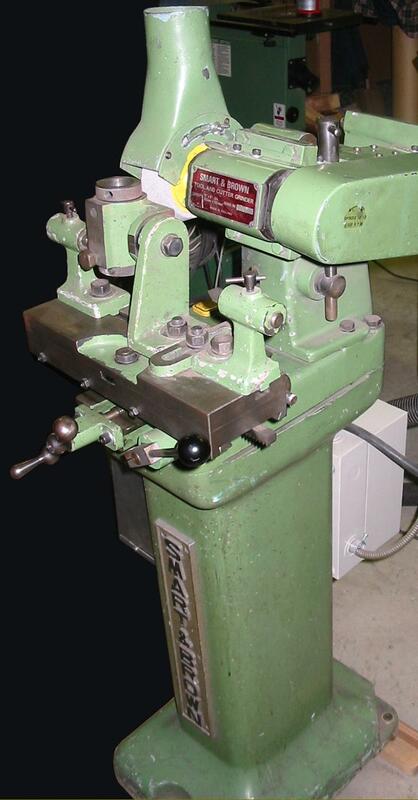 3 Clarkson Tool and Cutter Grinder was sold complete on a self-contained stand with built-in electrics. The main improvements over earlier versions centred on the use of a swinging rise and fall column at the rear (under the control of a handwheel working though bevel gears) and a longer table with improved travel in both directions. The accessories were also completely revised to make the most of the new machine's capacity and several new items, including adaptors to hold 30 and 40 International tapers, an indexing attachment, and a high-speed spindle (to 10,000 rpm) were added to the accessory list. The more heavily-built Clarkson Mk. 2 Cutter Grinder on its wider stand and with more sensible and complete guarding to the wheel and belt run. Visible in its recess on top of the table is a clamping bolt that allowed the upper and lower sections of the table to be rotated relative to each other. Following the design pattern of many competing machines the Clarkson Mk. 3 used a rise-and-fall column to support the motor and spindle assembly. The Universal Head with suitable adaptor bushes being used to relieve the flutes of a cutter without a centre hole. Guards removed for clarity. Toothrest Type A: for relieving staggered tooth cutters. Standard accessory. Toothrest Type B: for relieving spiral-fluted cutters. Standard accessory. Toothrest Type C: for relieving spiral-fluted cutters. The leading edge of this example has been thinned down to suit a small-diameter, shallow-fluted cutter. Standard accessory. Toothrest Type D: ground from the solid by the operator to provide extra rigidity when relieving the flutes of cutters without centre holes. Toothrest Type E: varying lengths to suit specific jobs. Made from old hacksaw blade. Toothrest Type F: varying lengths to suit specific jobs. Made from old hacksaw blade. Toothrest Type G: varying lengths to suit specific jobs. Made from old hacksaw blade. Toothrest Type H: hooked end to form a locating edge. Made from old hacksaw blade.